When you get the chance of a lifetime to eat one of the most exclusive steaks in the world, what would you eat it with? In the case of the FOODBEAST crew, that answer was instant ramen noodles. 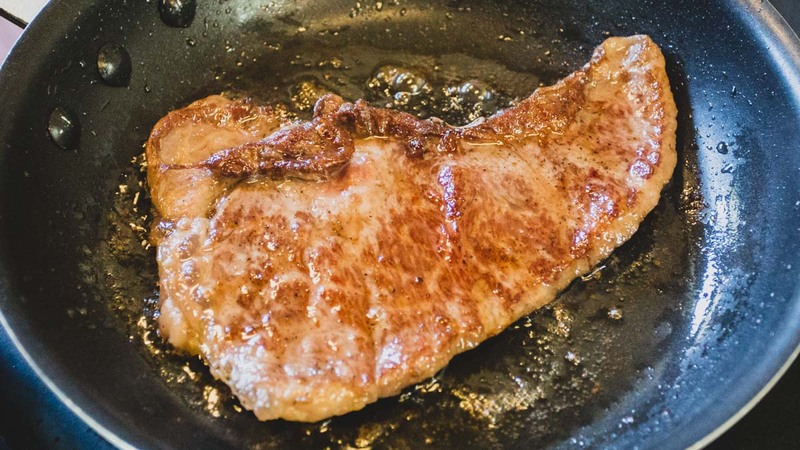 Recently, we were given the chance to try a couple of steaks off of a Hokkaido Snow-certified cow. This is huge, because Hokkaido Snow Beef is one of the hardest to find in the world. Only one or two cows get this classification on a monthly basis, and most of that meat never makes it stateside. As a result, the beef comes at a high price. For example, the two 12-ounce steaks (a ribeye and a New York strip) — provided to us by Holy Grail Steak Co. — cost about $300 each. Holy Grail gets their Hokkaido Snow Beef from Chateau Uenae, which raises them in the cold, snowy mountains of the Japanese island of Hokkaido. All of the beef certified as Hokkaido Snow is also A5 Wagyu, with A5 being the highest designated quality for beef, and has an extra layer of fat from their icy living conditions. The resulting meat is marbled with intricate patterns of delicious beef fat and tender enough to be cut with a fork. Now, we did pair these steaks with some instant ramen, but we first made sure to pay our respects to the beef and tried it in its pure, unadulterated form. Each cut was cooked as simply as possible, with just salt and pepper used to season with a dry cooking surface to let the beef fat render and enrich the meat even further. All of that rendering fat made for some soothing, sizzling steak ASMR, and we filmed the process on the Foodbeast Twitch channel, a clip of which you can relax to below. The taste of these steaks could best be described as a beefy butter. Actually, with the amount of marbling running through the New York Strip, it was essentially like eating fat scented with the meaty, caramel-like notes of beef wafting through. The ribeye was a more meaty cut and had a denser texture as a result, with the taste more akin to that of pure, unadulterated steak. Still, each cut melted in your mouth faster than a shard of dark chocolate would. What was the most mind-boggling aspect of the steak by far was its texture and tenderness. We've seen A5 wagyu get cut with a butter knife with ease before, but this Hokkaido snow beef was almost as fork tender as a piece of pulled pork. Slicing into it was so effortless that knives weren't even required. We then mixed up the classiness of the steak with the instant ramen of our childhoods and put an entire Hokkaido Snow Beef steak into a freshly brewed bowl of noodles. 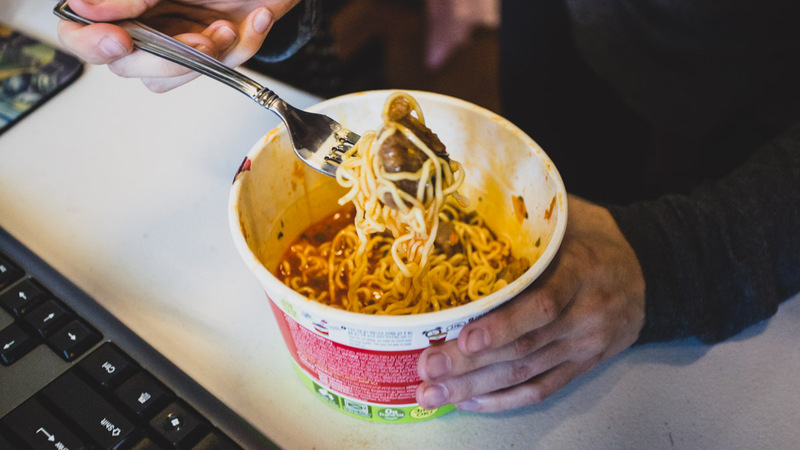 This was a particularly special instant noodle bowl, though, since it came with a fresh pack of kimchi on the inside. That acidity and heat combined with the steak was actually a flavorsome balance. While you may think that fancy steak and store-bought noodle packets wouldn't work together, this one did to the point where I felt guilty for enjoying it so much. Regardless of how you enjoy the Hokkaido Snow Beef, though, it is definitely a prized cut you should consume in the way you love best. If you want to try this exclusive steak for yourself, you can get it on Holy Grail's website. Currently, the online meat store is sold out of the beef, but you can sign up for notifications to be one of the first to snag a cut or two when it's available.